At Pocatello Zoo in Idaho, USA, a young wild marmot became trapped in a water tank, and drew the attention of Shooter, a four-year-old elk who is an exhibit at the zoo. After sniffing at and circling the tank for fifteen minutes, Shooter leaned into the tank, picked up the marmot in his mouth, and set it on the ground, before nudging it with his hoof. After catching its breath, the the rescued marmot scampered away. Shooter's actions were observed by surprised zoo staff. 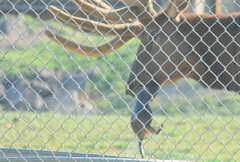 Whilst not sure if Shooter sensed the marmot was in distress - or just didn't like it in his tank - the staff speculate that, with the elk's basic needs being met, he was at leisure to exercise thought processes more complex than those needed for just basic survival. Way to go, Shooter. Hornheads Rule!